Cosmetic Packaging | Goldrich Printpak Inc.
First impressions are particularly important with luxury items such as perfumes, creams, lotions, make-up and other beauty care products. 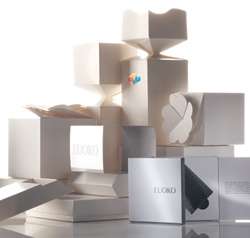 Packaging needs to be distinctive and elegant, while also being durable. It is often the simplest package design that demands the greatest attention, with elegance achieved in the details. Textured coatings, embossing, foil stamping and other finishing techniques allow for luxury in a minimalist design. This is where Goldrich’s custom structural design capabilities, graphic design and printing expertise excel. Partnership in the early stages of planning garners the most original and rewarding solutions. In the design stage, our familiarity with the requirements of North American regulatory bodies streamlines the approval process, avoiding unnecessary delays in getting your product to market. Other practical concerns, including date coding, batch coding, tamper evidence seals, theft prevention devices, cushioning inserts and shipping security are also expertly addressed.